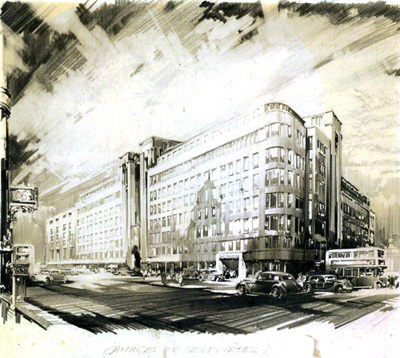 As well as painting posters and carriage prints Buckle under took a number of other industrial projects. These included buildings and factory units. The first picture is of the Colthrop paper mills at Newbury now derelict (2014). 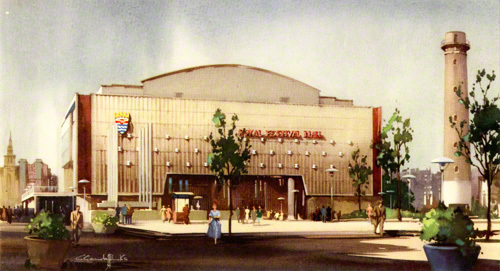 The next three pictures show examples of building architecture, Gamages and the Royal Festival Hall. 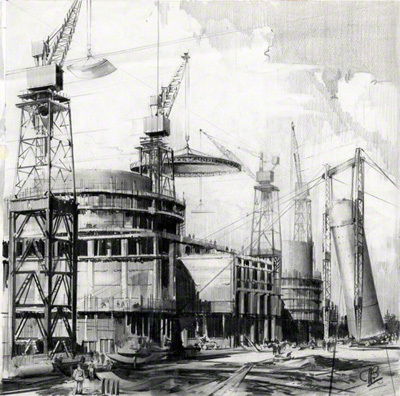 During the 50's Buckle painted a number of the emerging Nuclear power stations, including pictures of their construction, both in the UK and abroad. 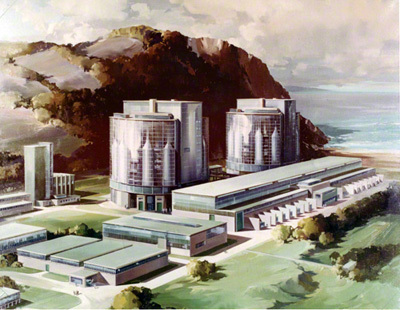 The commissions were obtained from Babcock and Wilcox Ltd and GEC group of companies and included the world’s first commercial atomic power station Calder Hall at Sellafield. 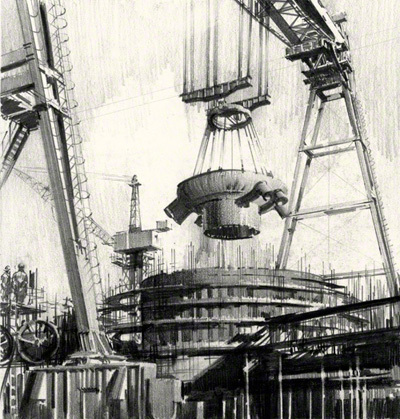 The painting of Hinkley Point A in oils, showing the construction using the Goliath Crane was used on the main stand at the world fair in Brussels in 1958. It is shown on Hinkley A page. 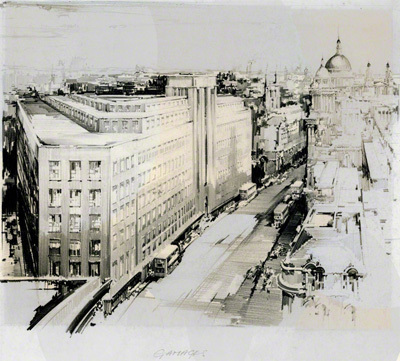 Claude Buckle was commissioned to paint and draw the main power stations being built in the late 50's and was heavily involved in representing their appearance before completion from architectural plans. He visited the many sites to draw rough sketches of the stages of construction for proposals for oil paintings. Four of the power stations are shown below in the order Calder Hall, Hunterston, Hinkley and Berkeley. Authors note. Anyone interested in the debate over Nuclear Energy can see in these page examples of the notorious Magnox Alloy design started in the 50’s. None of the Stations shown here can be fully decommissioned till 2070 onwards due to the problems of radioactive contamination.